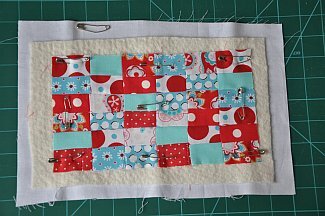 I know it’s a tad early to talk about Xmas but if you’re making hand crafted gifts then you need to start early! 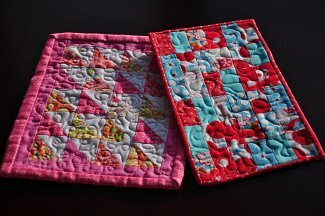 I’ve already made my mum a lap quilt and a table runner, and my grandma a table runner. 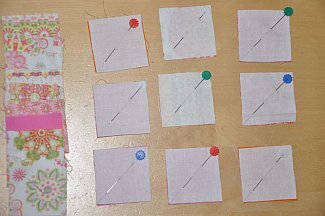 I’ve also stitched a few stockings for family in France. Now I’d like to make my son’s teacher a little something just to say thanks for their hard work. 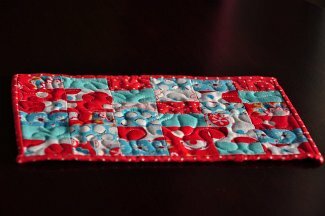 I am going to use some left over fabrics to make them a mug rug. 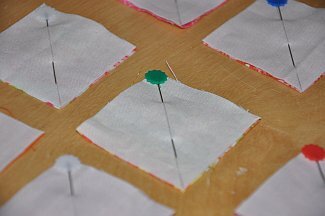 I’m not sure what their favourite colour are but my eldest assured me I could put a bit of pink in them… so here we go! 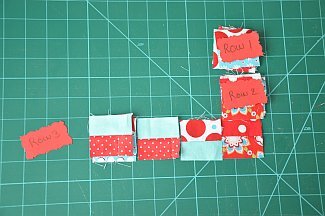 For the first mug rug, I had a few 1”1/4 strips left from a previous quilt so I’m going to sew the strips together and make lots of tiny rectangles. 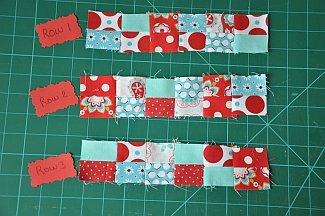 Start by sewing 2 strips together. 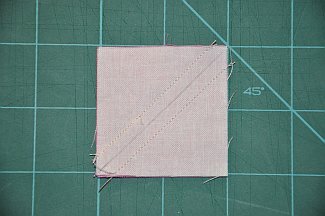 Cut your strip depending on how long you want your rectangles to be. 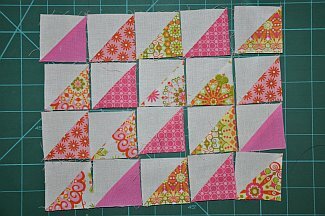 I cut lots of 2” squares. Repeat for all of your strips. 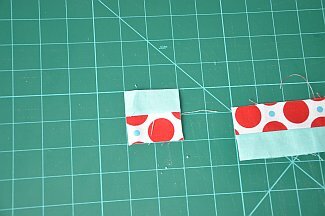 Now, place all your cuts on your table to decide how you’re going to piece them together. 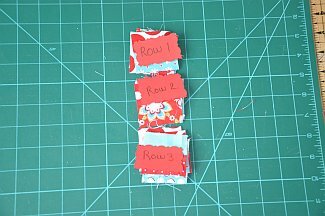 Start from the top and call it row 1, row 2. Row 3 etc…. 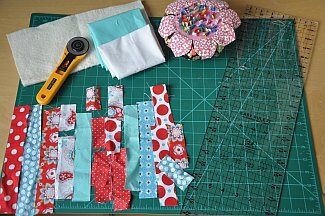 Sew band by band together until you have a big enough rectangle to welcome a cuppa and a couple of custard creams! 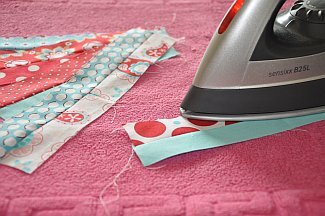 Now you need to sandwich your back fabric, your batting and your top together. 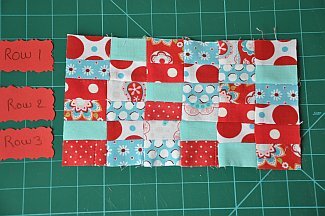 Lay your back fabric. 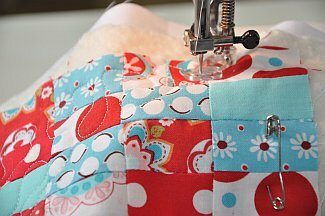 On top of it, lay your batting, and lay your lovely sewing on top of all that. 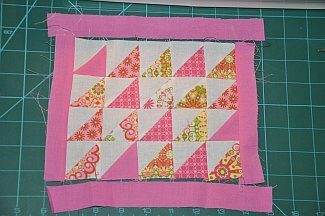 Make sure that the back fabric is larger than the batting, and that the batting is larger than the patchwork so that when you quilt it together you will have enough batting and fabric (made that mistake when I started and it was pretty frustrating). 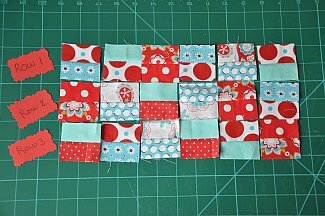 All you need to do is bind it together… Et voila! 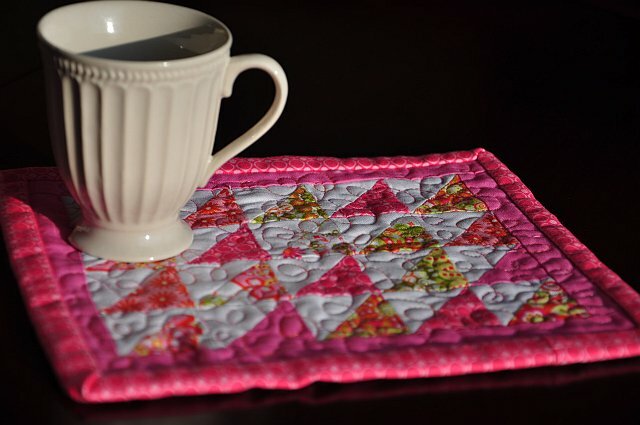 A little mug rug for a teacher! 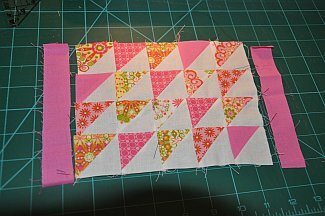 For the second one I will be using left over fabrics from those quilts and so I have enough fabrics to make tiny half square triangles. 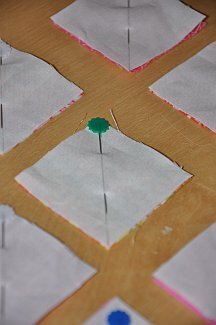 On your white squares, trace a line diagonally. 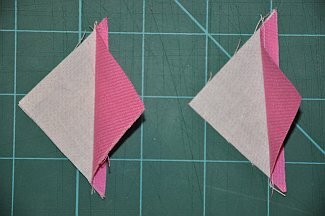 Lay one white square and one colour square right sides together. 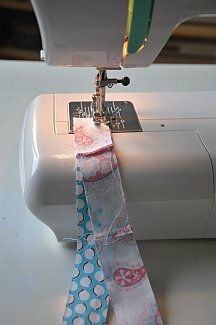 Sew a quarter of an inch away from your drawn line. Repeat on the other side of your drawn line. 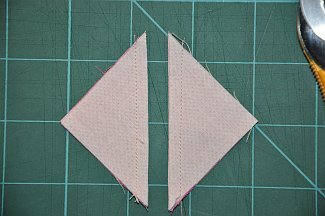 Cut on your drawn line. Repeat on all your squares. 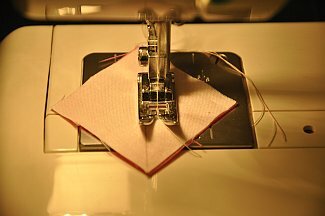 I sew chained mine to gain time and thread. 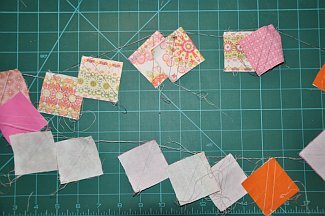 Then sew your squares together, then your strips and press. I added a little border. 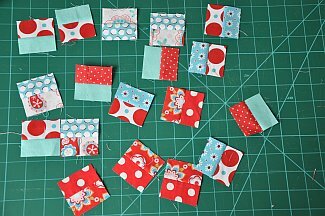 press (again!) and you’re done! 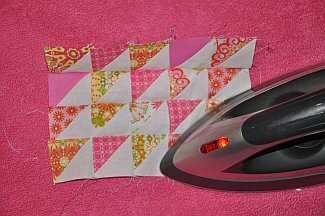 All you need to do is sandwich your top with backing and batting, quilt it and bind it. 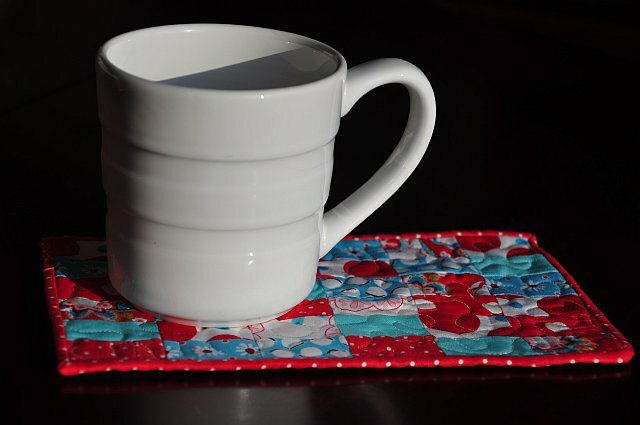 I hope my sons’ teacher will enjoy their little mug rug! J’aime vraiment beaucoup!!! 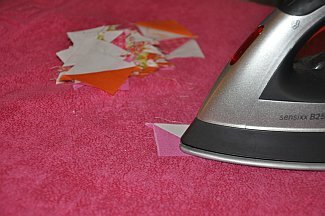 c’est super joli, je crois que je vais me faire un petit cadeau: une machine a coudre!!!! !